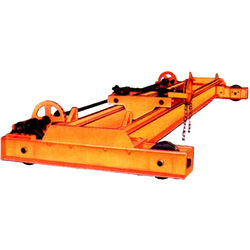 Our range of products include hand operated traveling hot crane. Our clients can avail from us an extensive range of Hand Operated Traveling HOT Crane which require least maintenance cost and guarantee hassle-free operations. These ensure safe efficient lifting shifting of heavy material load in factories workshops and warehouse. Our range is known to offer high performance and durability and is also equipped with high designing features that allow easy access in all directions.